STOCKHOLM (Reuters) - Swedish authorities searched the head office of Swedbank on Wednesday as part of an investigation into the bank's handling of money laundering allegations at its Baltic branches. Adding to pressure on the lender, Swedish state broadcaster SVT said separately that Swedbank was under investigation by the New York Department of Financial Services (DFS) for having misled investigators over customer transactions linked to Mossack Fonseca, a Panamanian law firm at the center of a global tax avoidance and money laundering scandal. SVT, citing sources, said the DFS had written to Swedbank on Feb. 20 informing it that it was looking into seven separate matters. A spokesman for the DFS declined to comment, while the Swedish Financial watchdog would not comment on whether it knew about the letter, nor the contents of it. Swedbank said it could not comment on any potential communication with the authorities for legal reasons, but added that it cooperates "fully and communicates clearly, truthfully and with good faith with all relevant authorities." 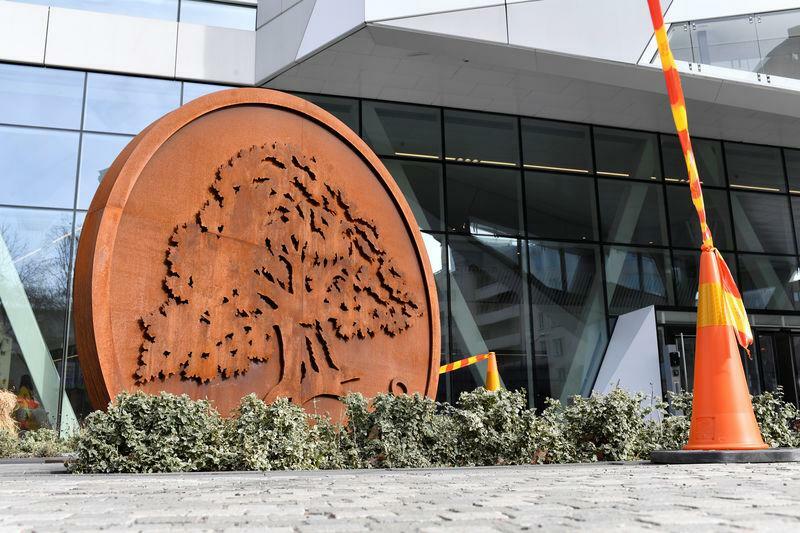 The money laundering allegations have sparked fears that Swedbank, the largest lender in the Baltic region, will be swept up in a scandal that has already pummeled rival Danske Bank, with the threat of lawsuits, fines and other legal sanctions. The Swedish lender has lost more than a fifth of its value since being linked with Danske, whose Estonian branch was used for as much as 200 billion euros ($227 billion) of suspicious payments between 2007 and 2015. Regulators in Sweden, Estonia, Latvia and Lithuania began a joint investigation into Swedbank after SVT in February reported allegations that at least 40 billion Swedish crowns ($4.3 billion) in suspicious transactions took place between Swedbank and Danske Bank's Baltic accounts over the same period. Sweden's Economic Crime Authority (EBM) said its search of Swedbank's head office was part of its independent probe into whether the bank breached insider trading regulations by informing major shareholders about SVT's initial report before the information was made public. "At this point of time, no individual or legal entity has been served (with a notice of a) suspicion of (having committed) a crime," Swedbank said in a statement following the search. The bank's third largest shareholder Alecta welcomed the EBM's investigation. "In everything related to the money laundering issue at Swedbank, facts are needed on the table and as much transparency as possible," Alecta, said in an emailed comment. "It is good that EBM is now doing everything they can to contribute to clarity in this matter." Swedbank's shares extended the session's losses to trade down 6.9 percent on the day by 1248 GMT. The lender is defending itself on many fronts: Bill Browder, an investor who campaigns to expose money laundering, has filed a separate criminal complaint with Swedish authorities and SVT previously reported that internal documents show Swedbank's board knew it had missed suspicious transactions but failed to take corrective action. Swedbank has in each instance said it cannot comment on specific transactions or details about clients due to banking confidentiality laws. CEO Birgitte Bonnesen, who oversaw the bank's anti-money laundering policy between 2009 and 2011 before heading its Baltic operations until 2014, has repeatedly said she has confidence in the lender's anti-money laundering procedures and that the bank reported suspicious transactions to authorities. But in recent days investors have criticized Swedbank's handling of the issue, setting up for a showdown with management at the company's annual general meeting on Thursday. SVT said earlier on Wednesday it had obtained confidential documents showing that Swedbank told the New York State Department of Financial Services it only had customers from Sweden and Norway, with ties to Mossack Fonseca. That was despite the fact that a number of companies with ties to the law firm had done business through Swedbank in the Baltics, SVT said. Neither the U.S. Embassy in Sweden, which in February asked the country's financial watchdog for a meeting to discuss the allegations about Swedbank, nor Sweden's financial watchdog had any immediate comment. The U.S. Securities and Exchange Commission (SEC) declined to comment, while the U.S. Department of Justice (DoJ) and the New York State Department of Financial Services were not immediately reachable for comment outside of regular U.S. business hours.